The day after I arrive in Guatemala, a girl is macheted in the face, just across the street. A tourist, wandering between villages on Lake Atitlan, she was jumped by a supposedly mentally-ill man waving a machete, and hit – messily – across the face. 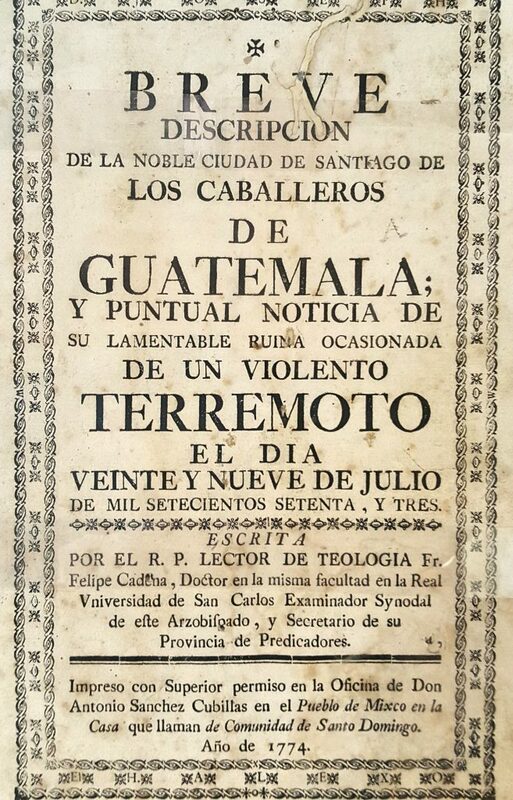 “A brief description of the violent earthquake in Guatemala”, from the antique book museum in Antigua. There is a well-known saying in Spanish: “Salir de Guatemala y caer en Guatepeor”. In English, this would be translated something like “to leave Guate-bad (mala) and fall in Guate-worse (peor)”. The pun is pretty mala (and my benchmark for puns is low) but, I wonder, does the truthfulness of the saying depend upon a negative view of Guatemala? In other words, is it just silly wordplay – like “from Islamabad to Islamaworse” (you’re welcome) – or is it more semantically meaningful, like “out of the frying-pan into the fire”? I would not be surprised if it were the latter. For a handful of reasons, not all reasonable, Guatemala has spent much of its past being linked in the Western imagination with violence and tragedy; and after this first night, I start to wonder if it’s all true. But there’s another quote about Guatemala which reads something to the effect of “there has never been a greater combination of tragedy and beauty”. One of the best-known histories of the country is called “A Beauty That Hurts”, and another talks of Guatemala’s “numerous contradictions of beauty and violence that captivated and mystified”. This is all I can think about on that first night. True or not, the rumour has provided the appropriate counterweight to the almost-overwhelming beauty which I’ve been swimming in since I arrived. Guatemala may have tragedy, but it also has crystal lakes surrounded by forest green volcanoes, centuries-old moss-covered ruins, and surely one of the strongest literary cultures per-capita in the world. How many other countries of Guatemala’s size and GDP could boast Nobel prize winner in 1967? 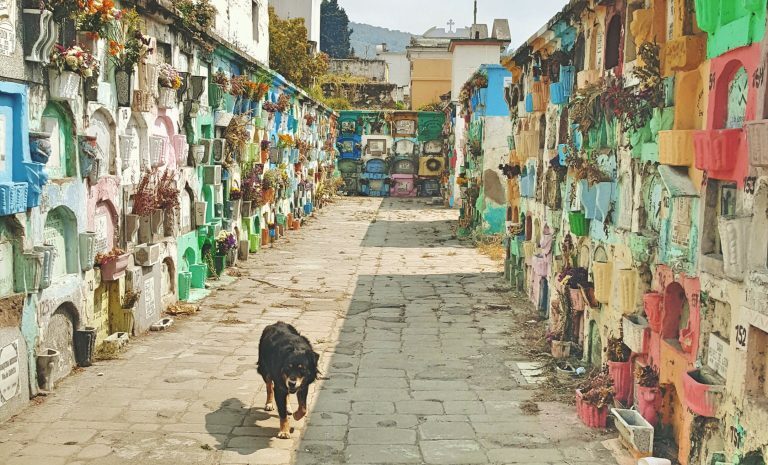 Cemetery in Xela, Guatemala. This one’s just for paw folk. In the end, this decides my book choices for Guatemala. I actually have enough time here to plan properly and read more than my usual one book. In fact, I work my way through various histories before I arrive (George Lovell’s is the best, along with Schlesinger and Kinzer’s Bitter Fruit: The Story of the American Coup in Guatemala (1982)). I also track my journey through the country using John L Stephen’s famous travel memoir Incidents of Travel in Central America (1841). And not for me the usual last-minute trawl through scrappy not-quite-bookshops, thanks to a Guatemalan friend who not only lends me various English-language paperbacks, but also puts me up for a few months in Antigua, a city well-stocked with libraries and bookshops. Luxury. 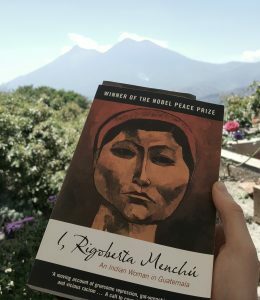 Representing tragedy, I have the non-fictional I, Rigoberta Menchu: An Indian Woman in Guatemala, the now-canonical testimony of oppression by the Guatemalan military, which won the Peace Prize in 1992. For the other half of this imagined rubric, I have Leyendas de Guatemala (Legends of Guatemala) by Miguel Angel Asturias, who won the Literature Prize in 1967. Though he won primarily for his longer novels, Legends of Guatemala is a collection of poetic and theatrical works. I also elect to read it in the original Spanish, which reduces my reading speed to that of a small child. 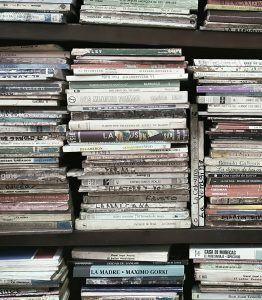 I carry the paperbacks across the country, reading them on chicken buses until the 60mph bumpy roads threaten to make me sick, and I can no longer underline the harder words in Spanish. I read them on a wooden boat up the river to the Caribbean coast, and in the shadow of vine-covered Mayan temples, baking in the jungle sun. In the end, one of the books fits its category better than the other. I, Rigoberta Menchu, dictated to Elizabeth Burgos in 1982, is a truly tragic testimony of genocide, torture and the suppression of an indigenous peasant class. It’s hard to find any beauty in it, especially its monotonous, at times mind-numbing, writing style. It’s a vital witness of a horrible moment in history, and it’ll no doubt be on International Development BA syllabi for a few years yet, but it’s not one for enjoying. My Spanish teacher in Antigua is a mixed K’iche’ Maya, like Menchu herself, and I ask her about the book. “Muy importante”, she says, nodding. Had she read it, I ask? No, and nor by the sounds of things had anyone she knew. She also elected not to vote for Menchu when she ran for Guatemala’s presidency back in 2011 and 2007. “Es complicado”, she says, and I leave it there. Legends of Guatemala on the other hand, she had read, though not in its original form. It’s been excerpted in various mass-market almanacs of jokes, short stories, recipes, Christian allegories, and other bits and pieces, which are popular in Guatemala. Published in 1930, the book was Asturias’ first and is a retelling of Mayan myths and origin stories, including those of the K’iche’ Maya (so there’s a flying chance that Rigoberta Menchu herself would’ve read this book). Most of the tales are short and hypnotic, like ‘Legend of the Volcano’, which tells the mythic story of how volcanoes were formed by six men, two gods, and a handful of star-eating. For me, honestly, it was probably a little over-optimistic to attempt such a literary work in Spanish this early. In the end, I only just scrape over the line to finish it before I leave, and for the most part my over-literal translation has butchered any real poetry in the book. Still, I get glimpses of its obvious beauty, and naturally, a wholesome dollop of tragedy too. I put Asturias’ most famous novel, The President, on my reading list for another time. After several months in the country, and a stack of new books, my knowledge of Guatemala has grown, though I still feel like every new day of learning, produces two days’ new questions. The one thing I have learned is a totally biased love for this beautiful country and the people who live here. The sadness of the first night has been forgotten. You could say I left Guatemala and fell in Guatamor. W. George Lovell – A Beauty That Hurts; Curtis D Holder, available here; I believe this quote is from the foreword of Bitter Fruit, but I don’t have my copy to check for the exact quote. Corrections welcome. The ‘non-fictional’ tag has been hotly debated, thanks to some accusations that Menchu’s account was not wholly authentic. I’m not going into it here, but the background of that debate can be explored in some depth here and here.